At En.Zo, each object we make is a stand-alone piece. Our craftsmen and women treat each component of your project as a sculpture in its own right. 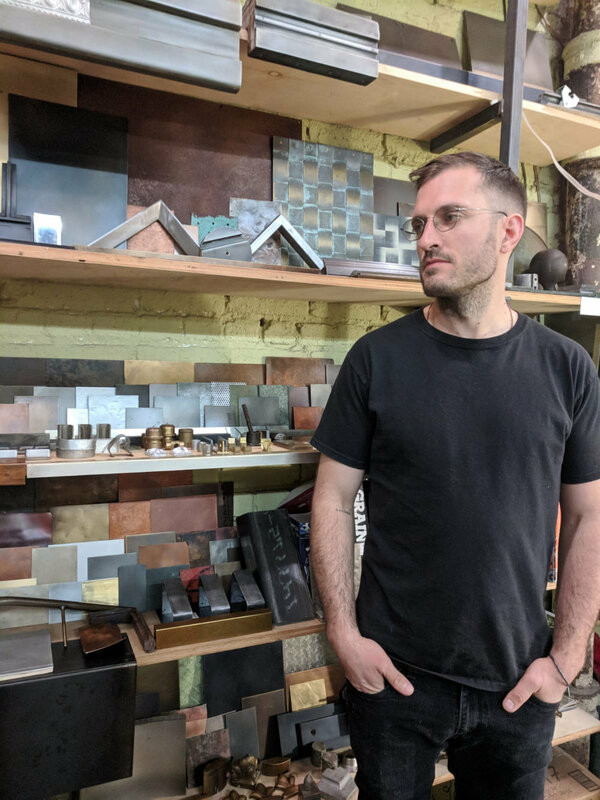 En.Zo Metal is a custom metal fabrication shop in Brooklyn, NY. We build, ship and install fine architectural metalwork throughout the United States and Europe. En.Zo sets the standard for metal fabrication and custom patina finishing in New York. We pride ourselves on our cost-effective approach that allows us to efficiently create uniquely crafted architectural elements while meeting your cost needs. At En.Zo, we are experts at meeting short deadlines without sacrificing the integrity and quality of our work. Our portfolio includes large-scale commercial projects, residential architectural metalwork, custom furniture and sculpture fabrication. We work in steel, bronze, brass, copper, zinc, aluminum and stainless steel. We offer a wide range of precision fabrication capabilities including CNC milling, waterjet and laser cutting, precision bending, CAD and more. Our commitment to the latest technological advancements is balanced by our focus on skilled craft. Our fabricators and artisans have extensive experience ranging from hand-crafted, decorative ornamentation to large-scale architectural metalwork. En.Zo Metal is world-renowned for its proprietary, hand-applied patina finishes. Our unique patinas and textures accentuate the hand-honed quality of any surface. Formulated in-house, En.Zo patinas are highly customizable and are the product of decades of experience and dedication to fine metalwork. Ongoing advisement on maintenance of our custom patina finishes is always provided upon completion of the project. En.Zo Metal was founded in 1997 in Brooklyn, New York by master craftsman, William R. Nitzberg. William specializes in fine craftsmanship, attention to detail, and original designs. He has nearly 40 years of experience in residential and commercial metal work, as well as fine art and furniture fabrication. The hallmark of William's work is an extensive palette of unique, hand-applied metal patinas and textures that have rapidly acquired a strong reputation among En.Zo's international clientele. In 2015, Andrew McNay joined William as a partner at En.Zo. Andrew comes from an eclectic background that brings together high-end custom fabrication and custom design. He has studied computer science, chemistry and a range of fine art techniques. Over the past decade, Andrew has worked in New York as a fabricator. He has extensive experience managing every step of a project, from creating CAD drawings to hands-on fabrication, finishing and on-site installation.